This article is about Sonic's appearance in Super Smash Bros. Brawl. For the character in other contexts, see Sonic the Hedgehog. Sonic, also referred to by his full name Sonic the Hedgehog (ソニック・ザ・ヘッジホッグ, Sonic the Hedgehog), is a character from SEGA who appears in Super Smash Bros. Brawl as one of the two third-party characters (the other being Snake from Konami). 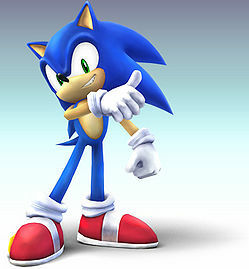 Sonic was the first unlockable character to be playable prior to the game's release. He was first playable in Nintendo Media Summit in October 2007, shortly after he was confirmed to be in the game. A swift character, Sonic runs at an extremely fast pace that surpasses even Captain Falcon. Nintendo Power states that since Sonic is not well known for his fighting skills, some of his fighting moves were influenced by SEGA's fighting property, Virtua Fighter. A majority of Sonic's moves are also influenced by SEGA's Sonic the Fighters and (to a much lesser extent) Sonic Battle. He is voiced by Jason Griffith in the English version, and by Junichi Kanemaru in the Japanese version. Sonic is currently placed at 22nd on the Brawl tier list in the middle tier, which makes him the lowest ranked unlockable newcomer. Sonic is most known for his incredible movement speed, possessing by far the fastest dashing speed, as well as among the fastest walking and air speeds. His movement is boosted farther by his Spin Dash and Spin Charge moves, which allow him to rip across the stage at incredible speed while simultaneously attacking and/or jumping. The aforementioned Spin moves give Sonic a plethora of options to attack and confound the opponent, which can make it incredibly difficult to hit Sonic, while also aiding Sonic's ability to time out opponents. Additionally, Sonic possesses one of the best recoveries, which contains many options, while gaining great distance and generally making it difficult to edgeguard Sonic. Sonic also possesses an effective grab and throw game, and generally great damage racking abilities from his Spin moves, up throw, and effective combos. Sonic is nearly crippled regarding his KOing ability, though, being arguably one of the weakest characters and having few finishers, none of which are particularly effective. Sonic possesses what is considered one of the worst movesets, which, outside his special moves, consists almost entirely of weak moves that either possess little utility or are outclassed by similar moves of other characters. While Sonic's forward smash and back air are fairly strong, those moves, along with the character in general, suffer from generally poor reach, his lack of a proper projectile, and rather poor edgeguarding abilities against many characters (which exacerbates his already poor KOing ability). Overall, Sonic has average matchups, and his tournament results have been above average. Complete Classic Mode with 10 different characters. Play 10 hours of VS. matches. Have Sonic join the player's party in The Subspace Emissary (The Great Maze). With the exception of the fourth method, Sonic must then be defeated on Green Hill Zone. Sonic is the fastest character in the game, in regards to movement speed (fastest dash speed by far, third fastest walking speed, sixth fastest air speed, and very fast rolls). However, only about half of his moveset has speed to match, none of them being KO moves. Sonic's relatively small hitboxes and lack of a projectile (excluding his Spring jump which can only be used in the air, travels downward, and can be used by opponents if used on the ground) mean that he must stay close to the opponent in order to attack, but his aforementioned speed mitigates this problem. His ability to spinshot (holding Spin Dash and releasing as one pushes the C-Stick downwards) allows him to quickly bypass the effects of most projectile campers, and his side special can clank and cancel out the effects of certain projectiles, such as Snake's C4. His tremendous running speed, his Spin Charge and Spring Jump and specials, and down air give him excellent follow up ability on practically every character. Even though Sonic can easily rack up damage, he arguably has the hardest time landing a KO move, as all of his KO moves are unreliable, he has no guaranteed setups to them, and he lacks an early KO move. Sonic has only four ways to reliably KO the opponent (back and up aerial, and forward/down smash), all of which have weaknesses that prevent them from being reliable KO moves. All of Sonic's smash attacks have too much start-up time to be reliable finishers. Sonic is one of the more difficult characters to gimp in the game, given his tremendous vertical recovery, as well as his theoretically limitless horizontal recovery (Homing Attack) should an opponent be off the stage with him. Sonic has the ability to wall jump, however; should an opponent be in place at all, invincible or not, Sonic will not have enough time to both attack and successfully grab the edge. Sonic also has surprisingly good survivability despite being a middleweight by nature. His down and side specials serve as excellent momentum canceling attacks, which, when coupled with his ability to recover, can allow him to survive until very high percentages, although they are still incomparable to the survivability of characters heavier than him. Sonic's attacks are primarily offensive in nature, and his air game and air speed are good enough to accommodate attacking in the sky as well. Sonic can remain in the air indefinitely with careful use of his neutral special, Homing Attack, and with proper placement can either stage spike or gimp in this manner. Stage spiking in general is an excellent offensive strategy for Sonic; by running off the edge and immediately using back air, many characters or opponents who focus on ledge-camping (such as Pit) can be caught off guard for either a KO or a tactical advantage. Sonic's speedy and long-lasting dash attack is another move that can catch opponents unexpectedly, and its traveling distance usually prevents significant retaliation, such as shield-grabbing. Sonic has good punishment options. Many of Sonic's moves use the same spinning ball animation, making him a very difficult character to predict. Unlike some characters however, practice is required to fully unlock Sonic's punishment potential. Sonic has one of the best shields in the game, because of how quickly it pops out and the multiple ways he can go into it. Sonic can cancel any of his Spin Dashes/Charges into a shield, Spin Dash from the ground, and Spin Charge from the air. This allows Sonic to "fake-out" his opponents, causing them to make hasty moves on which Sonic can capitalize on. When an opponent goes into their knock down animation, Sonic's superior punishment comes into play. By moving closer to the opponent then stopping just outside their range, Sonic has the edge. Because of his speed, if they roll towards Sonic, away from Sonic or use their getup attack, Sonic can grab them as they finish their move. Sonic is surprisingly easy to grab out of his attacks, because many of his moves launch him straight at opponents, only to have Sonic finish the move next to the opponent. Mastering Sonic's running game is crucial to Sonic's ability to perform at higher levels, and is one of the factors that makes him so difficult to play competitively. Sonic users take advantage of a variety of dash or dash-related techniques that are seldom used by other characters. Dash-dancing is much less useful in Brawl than it was in Melee, but it can be extremely useful for mindgames in Sonic's gameplay, such as by running in one direction and then quickly turning the other way around to bait an opponent or catch him/her off-guard. It is often regarded by Sonic players that it is better to run away from the opponent and run back than to use roll-dodges to avoid opponent. This allows the player to avoid damage, not be as easily punished, have more control over their actions, and be able to punish their opponent's attacks. Dash-dance pivots (consisting of fox-trotting away from the opponent, then quickly dash-dancing backwards) are particularly effective for this, as they can cause almost immediate turnarounds and then grabs can then be used to punish opponents. Sonic's matchups are difficult to define, as they vary greatly from player to player, possibly moreso than for any other character. Sonic players to this day find it difficult to agree on which matchups are Sonic's worst. Depending on the play-style of the Sonic, he can have a decent matchup against almost any character in the game, even at competitive levels. Because of his prowess for mindgaming and switching up tactics, as well as the inherent strengths and weaknesses to each style of play, some Sonic mains argue that Sonic has no truly disadvantageous matchups as a character, and that his matchups are much more heavily influenced by playstyle than his actual attributes. However, most Sonic mains will agree that he does not have many, if any, truly advantageous matchups. 2% Punches twice, followed by a side kick. Known as the PPK (Punch Punch Kick). The attack comes from Sonic the Fighters. 4% (hit 1), 7% (hit 2 feet), 5% (hit 2 legs) Stands on both his hands and performs a horsekick that hits twice. The Horse Kick from Sonic the Fighters. 3% (early), 4% (hit 1), 7% (hit 2) Kicks upwards twice, similar to Captain Falcon's up smash. The Skip Kick from Sonic the Fighters. 6% Sweeps his foot along the ground, similar to the Leg Throw from Sonic the Fighters and the Foot Sweep attack from Sonic the Hedgehog (2006). If used repeatedly, it will slowly move Sonic forward. 6% (clean), 4% (late) Curls into a ball to rush at any opponent in front of him. The attack is similar to the Spin Attack from the Sonic the Hedgehog games. 14% Winds up his fist, then throws a punch forwards. Can be angled up or down. The Wind-Up Punch from Sonic the Fighters. One of his few KO moves. 5% (hit 1), 1% (hits 2-7), 3% (hit 8) Jumps and curls up into a spiky ball, hitting multiple times. 12% (early), 9% (clean), 7% (mid), 5% (late) Spin dashes back and forth over a short distance. The Dizzy Spin from Sonic the Fighters. 11% (early), 8% (mid), 5% (late) Curls up into a ball and moves in several circles. The Air Spin from Sonic the Fighters. 1-2% (hits 1-5), 4% (hit 6) Spins in a horizontal corkscrew, drilling with his head. The Emerald Dive from Sonic the Fighters. 13% (clean), 9% (late) A backwards roundhouse kick. Sonic's best aerial finisher. 3% (hit 1), 6% (hit 2) An upwards scissors kick. The first hit deals no knockback which links onto the second hit. 8% (clean), 7% (late) Sonic stalls for a brief moment, then shoots downwards foot first. A stall-then-fall move. The attack resembles the Stomp Dive from Sonic the Fighters and the Sonic Rocket from Sonic Battle. 3% (hit 1), 6% (throw) Attacks the foe with a high kick. The attack resembles the Top Kick from Sonic Battle. 8% Does a back flip while spinning and then slams on the ground, sending the opponent backwards with decent knockback. 3% (hit 1), 9% (throw) Throws the opponent up and sharpens his spikes, which then prick the opponent. 1% (hits 1-3), 5% (throw) Pins the enemy down, then Spin Dashes into them. The Double Spin from Sonic the Fighters. 6% Does a spinball sweep. 6% Does a quick foot sweep. 5% Does a spin kick while getting up. 8% Gets up onto the stage with a spinball attack. This attack resembles his cliffhanger flip attack from Sonic the Hedgehog Spinball. 6% (hit 1), 7% (hit 2) Slowly gets up and kicks twice. The only edge attack move that can hit twice. Homing Attack 8% Curls up into a spiky ball while ascending, aims for the nearest target, then crashes into them. Spin Dash 7-10% (dash), 5% (initial jump), 7% (jump) Curls up into a spiky ball, performs a short hop, then starts rolling towards the opponent at high speed. Easily combos into one of Sonic's aerial attacks. Spring Jump 4% Pulls out a spring from the Sonic the Hedgehog games and uses it to leap into the air. The spring acts as a projectile when used in the air. Spin Charge 4-11% (dash), 7% (jump) Works like Spin Dash, except there is no hop, and the player must repeatedly press the B button in order to charge it. Super Sonic 18% (startup & ram), 13% (idle) Transforms into Super Sonic, from the Sonic the Hedgehog games. The player can use the control stick or other movement buttons to make him fly in any direction they choose and ram into other foes. The transformation lasts for about 15 seconds. Sonic enters the stage in ball form from the foreground and gives a thumbs-up. Up taunt: Does a front flip, then crosses arms with his index finger pointing out while making a teasing clicking tune, which forms into one of his signature poses. Side taunt: Does a figure-eight peelout dash, similar to the Super Peel Out technique from Sonic the Hedgehog CD, saying "You're too slow!" (遅すぎだぜ！, You're too slow!) in a teasing manner. Down taunt: Says "C'mon, step it up!" while breakdancing. In Japanese, he just says "Come on." Looks at the camera while tapping his foot impatiently. This is a reference to his idle animation from the classic Sonic the Hedgehog games for the Sega Genesis. Turns towards/away from the player, waving his finger in a patronizing manner while grinning. This is the same as the final part of his promotion video on the DOJO website before he takes off. This is similar to an animation he performs after clearing an Act or defeating a boss in Sonic the Hedgehog 3. Go Go So-nic! Go Go So-nic! The score tally from most Sonic games since Sonic the Hedgehog. The "Mission Clear" theme from the 2006 game Sonic the Hedgehog. This is the only victory theme in Brawl to be ripped straight from another game. Around the beginning of Brawl's metagame, Sonic was considered a low tier, non-viable character by many players due to his terrible KOing power, poor moveset (due to many of his attacks having rather small and/or poor hitboxes), and perceived "low priority." At that time, he was ranked as low as 33rd in the first tier list (September 2008). However, dedicated Sonic players started placing much more favorably in tournaments; this caused Sonic to jump up eight places on the third tier list (June 2009), which is currently the biggest tier list jump in the history of Brawl, tied with Olimar from the first to second lists. Despite Sonic dropping mildly after this rise, players such as Espy and X accomplished even better tournament results for Sonic, with them placing 5th and 6th respectively at MLG Dallas 2010, the final MLG Brawl event. At Apex 2014, StaticManny placed 33rd with Sonic, having lost only to Mew2King's Meta Knight and Player 1's Diddy Kong, but not before defeating Larry Lurr's Falco, an incredible feat considering the match-up. Even after Brawl's decline in interest, Sonic still found decent results in majors, perhaps most notably Meekspeedy placing 9th and 4th at Get On My Level 2016 and Get On My Level 2017 respectively, 6WX placing 3rd at Glitch 2, and FRiSK taking 9th at CEO Dreamland. Sonic is currently ranked 22nd on the eighth tier list, as of April 2013. A few players still have a negative view of him, similar to Ike, but he is currently a stable mid tier character. Sonic in The Subspace Emissary. Sonic does not appear in The Subspace Emissary until the final battle with Tabuu, but unlike the secret characters (Wolf, Jigglypuff, and Toon Link), Sonic can be chosen to fight Tabuu after The Great Maze. When every fighter reaches Tabuu, he prepares his Off Waves, which had already turned every character into a trophy once before. Just as he's about to release the attack, a blue blur rams into both of Tabuu's wings, shattering them. As the blue blur jumps up on a peak, he reveals himself to be Sonic. While he taunts, Tabuu's wings break apart, and then six fighters are selected to fight Tabuu in the final battle. It is commonly believed that Sonic's minor role in the mode is due to the fact that he was added to Brawl's roster so late in development in 2007. Event 30: Sonic Boom: Sonic must defeat 15 other Sonics on the Green Hill Zone stage. Event 39: All-Star Battle x2: Sonic is one of the eight opponents fought in this event along with King Dedede, Ike, Lucario, R.O.B., Toon Link, Snake, and Wolf. Event 41: The FINAL Final Battle: The player must defeat Sonic along with Snake and a giant Mario on Final Destination. Co-Op Event 17: Sonic and Mario: Sonic and Mario must defeat 3 other Sonics and 3 other Marios on the Green Hill Zone stage. Co-Op Event 21: The True All-Star Battle: Two players select a character and take on the entire roster on Battlefield. Sonic's main and Final Smash trophies can be obtained by clearing Classic Mode and All-Star mode respectively with Sonic. The world's fastest hedgehog, who can run at supersonic speeds. Generally speaking, he loves being able to do what he wants and loathes being constrained. Holding still is something he would never consider. He's got a bit of an attitude but can't pass by someone in trouble. When he collects the seven Chaos Emeralds, he transforms into the mighty, gold Super Sonic. Sonic's Final Smash. The Chaos Emeralds give energy to all living things, and Sonic's gathered all seven of them, then used their power to transform into Super Sonic. His abilities in this form far surpass his normal ones, and he's even able to fly. He uses a lot of energy in this form, so he can only remain in it for a short time. Sonic dashes so fast that, when wearing a Bunny Hood, he can outrace both the Big Blue track and the water slope on Distant Planet to the point of self-destructing. Also, if Sonic has a Bunny Hood, Superspicy Curry, and two Super Mushrooms, he can even outrun the iceberg on Summit. Along with Zero Suit Samus, Sheik and Squirtle, Sonic is one of the only characters to not be seen in trophy form during The Subspace Emissary, due to his late appearance. Coincidentally, all four of these characters' names begin with the letter 'S' and they all have some form of a blue-colored default palette. Of these characters, Sonic is the only one whose default palette is considered by the game to be truly blue, since unlike the others, he can use it for team colors. Additionally, he, out of the four, is the only one who is not part of a transformation gimmick. In the video game convention E for All, Sonic was the only unlockable character to be playable in the demo. Sonic is the only unlockable character in Super Smash Bros. Brawl who has four, rather than three, unlock methods. Sonic and Zero Suit Samus are the only characters not fought in any form in The Subspace Emissary. Sonic is the only non-Pokémon character to have less than six palette swaps. Sonic's page on the Smash Bros. DOJO!! This page was last edited on March 29, 2019, at 20:31.